Posted on May 29, 2015 by Hawaii's Local Buzz. 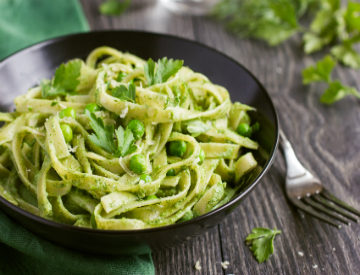 Fresh, green pesto is delicious on pasta, salads and sandwiches. Most pestos are made with pine nuts, which add creaminess and a hint of earthy flavor. However, if you love creamy, natural pesto, there’s an even better choice: make yours with macadamia nuts instead. This drool-worthy macadamia nut recipe will soon become a family favorite! Place all of the ingredients, except for half of the olive oil, in a food processor with a sharp blade. Process until smooth. You may have to stop the food processor and scrape down the sides several times during processing. Drizzle in the remaining olive oil, and continue processing until the mixture is smooth and even. This pesto is best served fresh, but it will store in the refrigerator for several days. It’s delicious mixed into spaghetti or angel hair pasta. Try using whole wheat pasta for a healthier meal. The fiber in the pasta and the omega-3 fatty acids in the macadamia nuts are a very heart-healthy combination! You can also serve a dollop of this pesto on top of a fish filet or chicken breast. It is delicious spread inside a turkey sandwich or tucked into an omelette. Find the perfect nuts for this drool-worthy macadamia nut recipe at Hawaii’s Local Buzz. Our nuts are dehydrated, not roasted, so they taste as fresh as possible.